Trying to eat better but craving pizza? These protein-packed pizza cups will do the trick. Chop up 25 pepperonis into small pieces. In a bowl, combine all ingredients except the remaining 12 sliced pepperoni. Spray a muffin pan with nonstick spray. 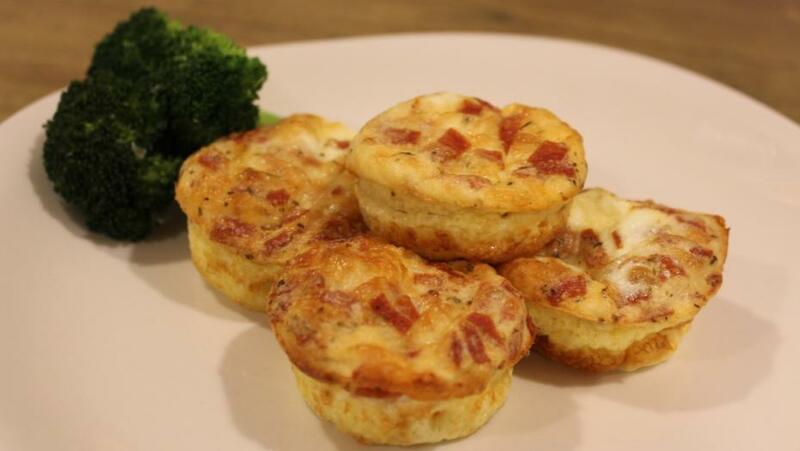 Place a whole sliced pepperoni in the bottom of each of the 12 muffin molds. Pour or spoon in the mixture in your bowl into each muffin mold evenly ¾ full. Bake in the oven for 20-25 minutes. Place a toothpick in the center of the pizza cup to ensure all liquid egg has cooked. For a crispier pizza cup, leave in the oven a little longer. Let cool for a few minutes before serving. Enjoy!